Since most of us rely upon the Internet for day-to-day activities today, hacking and spying have become a prime concern, and so have online security and privacy. The Internet has become a digital universe with websites collecting your sensitive information and selling them to advertisers, hackers looking for ways to steal your data from the ill-equipped networks, websites, and PCs, and government conducting mass surveillance—every model has shifted to data collection. Virtual Private Network—Yes, one of the most efficient solutions to maximize your privacy is to use a secure VPN service. VPN serves as an encrypted tunnel between your computer and destinations you visit on the internet to secure your Internet traffic and protects you from bad guys getting into your network to steal your sensitive data. When choosing a VPN, Private Internet Access (PIA) comes out to be one of the best-performing VPN services available in the market. Most VPN providers offer one primary encryption method (usually the strongest available to make sure nothing goes awry), but PIA provides a few different methods on their OpenVPN tunnels depending on what criteria you are concerned. By default, PIA uses the OpenVPN protocol with AES-128 encryption to protect data transmissions, SHA1 to authenticate the data and RSA-2048 to set up the secure server connection. However, you can mix and match encryption protocols as per your needs, or select presets labeled such as "All Speed No Safety," "Risky Business" and "Maximum Protection." you can also use the PPTP or L2TP/IPSec VPN protocols instead of OpenVPN protocol if you want to mask your IP address, and/or circumvent censorship and geolocation. Besides providing strong encryption protocols, PIA does not log user activity that will monitor and record data points from your VPN activity. One can sign up for PIA with only a valid email address—no real name required. PIA takes payments in Bitcoin, Cashu and gift cards as well. PIA also allows you to use P2P file-sharing networks and BitTorrent on its servers, which is convenient. The service also provides an ad-, trackers-, and malware-blocking tool, called PIA Mace, that blocks annoying advertisements across web pages, trackers that allow marketing companies to track you throughout the Internet and malware that could steal your data. There is also a 'Kill Switch' feature included in Private Internet Access, which shuts down all the internet-connected applications when your VPN connection suddenly disconnects. Regardless of the VPN service you use, it will affect your Web browsing speeds. PIA has more than 3272 servers in 25 countries around the world including Asia, Central America, Europe, India, the UK, South America, and the United States. No matter where you go, you are very likely to find a nearby server. So, overall, PIA's speeds are good. The service takes a few seconds to connect securely through PIA's network and allows users to stay online for more than 12-hour period without reconnecting. PIA is available extensively across most major apps and operating systems. It has applications for Windows, macOS, Linux, Android, and iOS. There is also a Chrome extension. As far as usability goes, PIA allows you to connect up to 5 simultaneous devices from a single account at any given time. There are no bandwidth restrictions or throttling to worry about. PIA's few extra features include IPv6 leak protection, DNS leak protection, and an encrypted WiFi network. 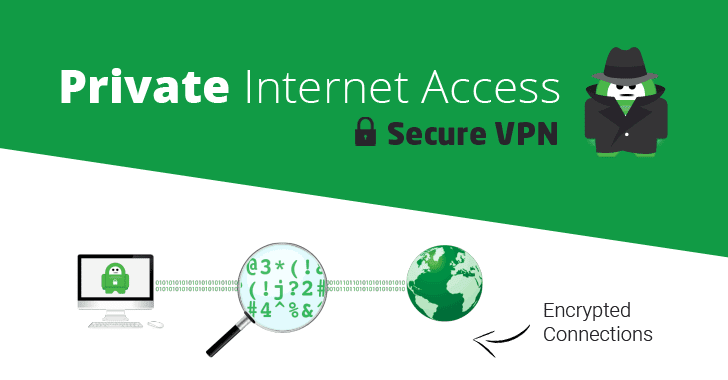 The Private Internet Access VPN: 2 Year Subscription is available for just $59.95 at THN Deals Store, which usually costs $166 if you buy from its official website—isn't this an excellent deal. User coupon code PIA15 for additional 15 %discount.